What's a girl to do when meeting The One means she's cursed to die a horrible death?Life hasn't been easy on sixteen-year-old Emma Conner, so a new start in New York may be just the change she needs. But the posh Upper East Side prep school she has to attend? Not so much. Friendly faces are few and far between, except for one that she's irresistibly drawn to—Brendan Salinger, the guy with the rock-star good looks and the richest kid in school, who might just be her very own white knight. 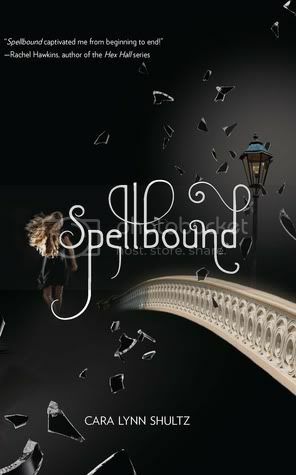 Spellbound is a YA Paranormal Romance book by debut author Cara Lynn Shultz. I really didn’t know what to expect going into this book, but it turned out to be a really quick, enjoyable read. The characters in this book were very likeable. The main character, Emma, has been through so much in her short lifetime. But that only makes her stronger. She’s definitely not a whiny heroine. I like that she’s such a strong character, and I enjoyed watching her grow throughout the book. I really didn’t think I was going to like Brandon much in the beginning. He confused me, and it took a while for me to figure him out. But once I did, I really liked him. I really liked their relationship as well. Emma’s cousin, Ashley, and friend Angelique were well written secondary characters. The one character that really bothered me was Anthony. Can we say Aggressive, much?? He took bullying to a whole new, disturbing level. The story was very creative and the writing was simple, but engrossing. There were some parts of the book that were a bit slow, but other parts that I got into so much, that the story just flew by. Overall, this was a really enjoyable read, and I’m looking forward to adding it to my collection! I'm glad I read down to your review because the goodreads blurb made Emma sound a bit needy and tragic. Glad she turned out to be a strong heroine. Looks like and intersting book. One of the things I liked about the book was the author's lack of fear to discuss things that happen in high school with regard to both Anthony and Kristin, even if it was a bit surprising here and there. I'm just glad Emma had the friends to help her out. Loved this book. This one's on my Kindle -- sounds like a beach read for me (next week!). Thanks for your thoughts. Glad to see another *strong* female character. I have no patience for whiners! I haven't read this book yet but have been hearing such great things about it! I really loved your review and am looking forward to reading this book! I reviewed this one a couple of weeks ago. The synopsis really doesn't do the book justice! Great review, Christy! Excellent- this sounds like a great book! I'm a big fan of simple but engrossing stories. And the characters seem great. Looking forward to reading this one soon. I love that Emma isn't a typical heroine. I like books that have strong, awesome female characters. This sounds really good, I am going to have to grab a copy and read it! Great review! I'm about halfway through this one. It's really good so far! Great review, sweets! I've been excited about this book for awhile- it's sitting in my netgalley books and is dying to be read! I can't wait!! Great review! I'm a new follower- lovin your blog and can't wait to read more!